Ich hatte vor kurzen die erste Anfrage, in der ein Media Kit verlang wurde. Doch, was gehört eigentlich alles da rein und wie wird es aufgebaut? Recently I got an inquiry where a media kit was required. But, what facts should it contain and how is it build? Ein Vorteil oder Nebeneffekt des Bloggens sind die Anfragen, die Firmen stellen, ob man Produkte vorstellen oder man deren Shop auf seinem Blog vorstellen mag. Nicht selten gibt es dafür eine kleine Entlohnung oder ein Produkt dieser Firma. Doch wer nun denkt: wie, ich habe bis jetzt ja noch gar keine Anfragen erhalten. Seid beruhigt, auch ich musste lange darauf warten. Mit den Followern/Besuchern kommen eben auch die Anfragen. Da ich nun selbst eins erstelle möchte ich direkt die Gelegenheit nutzen, meine Erfahrungen bzw. Erkenntnisse mit euch zu teilen. gebt Kontaktmöglichkeiten an eMail, Tel., etc. Wann habt Ihr den Blog gestartet? Wie sieht die Entwicklung aus? Mit welcher Frequenz wird gepostet? Welche Themen/Artikel laufen besonders erfolgreich? Wie viele Unique Visitors im Monat? Wie sehen Eure Abonnenten-Zahlen aus? Wie viele Follower/Fans habt Ihr in den sozialen Netzwerken? Ihr habt zufriedene Kooperationspartner, deren nette Worte Ihr öffentlich zitieren dürft? Mit sogenannten Testimonials könnt Ihr einen schönen Einblick in Eure gemeinsam mit Kooperationspartnern umgesetzte Projekte geben. Am Besten verwendet die gleichen Schriftarten und Farbtöne wie auf eurem Blog, lässt das Gesamtbild einfach stimmiger erscheinen. Weniger ist oft mehr. Keiner möchte endlose Romane lesen müssen. Packt alle wichtigen Daten zusammen und versucht sie so kreativ wie möglich, in euer Kit einzubinden. Als Programm habe ich picmonkey verwendet. Neben Paint, Photoshop, oder Gimp, kann man auch auf Word oder PowerPoint zurückgreifen. One advantage of blogging is that you get asked by companys whether to introduce their products or introduce thier onlineshops on your blog. It is not unusual that you receive a small remuneration or a product of this company. But who now thinks, I haven't received any requests so far. Be patient, I also had to wait a long time. With the followers / visitors just come the inquiries. Finally I have to create my own media kit and I would just take the opportunity to share my experiences and knowledge with you. Basically, it presents you and your blog briefly. It's like an application for a job. give contact details to email, tel., etc. When did you start the blog ? How is the development? With what frequency is posted ? What are your topics ? What topics / articles run particularly successful? How many unique visitors a month ? What are your subscriber numbers? You have satisfied partners whose kind words you can quote to your public? With so-called testimonials you can give with cooperation partners implemented projects a good insight into yours. Uses the same fonts and colors as on your blog. Less is often more. No one wants to read endless novels. Pack up all important data and try to be as creative as possible, to include everything in your kit. I have used PicMonkey. Besides Paint, Photoshop or Gimp, you can also rely on Word or PowerPoint. Habt ihr ein Media Kit? merci für die Tipps, denke zwar nicht das mein Blog irgend wann mal so weit ist, dass ich das benötigen würde, da es so viele gute Foodblogs gibt, aber trotz alle dem sehr interessant! Das ist wirklich mal ein hilfreicher Post! Vielen Dank :) Und dein Media Kit sieht auch schon richtig schön aus. Your posts always are quite useful we i mean serious bloggers need this, i agree with your opinions 100%, this is my second year of blogging and recent three months i got more requires from press or outfits brand, web design, content writing, are the two keys for a blog being successful. You already achieve that, cheers. Danke für den tollen Beitrag! Bin auch gerade dabei meines zusammen zu stellen. 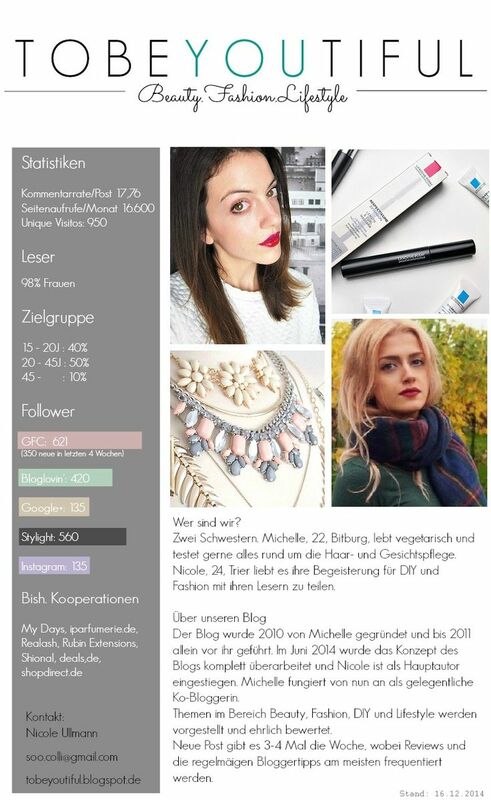 Hab mir jede Menge Inspiration von eurem Layout geholt, sieht sehr schick aus! thank you for those tips. They are very helpful. I've got a good few requests, but if product -for example clip on hair- is not something that I don't use or like, I simply say no thank you. Maybe it's bad, but I try to stay true to myself. Your posts are always so useful! I dont have it but I think it very helpful so will do one, following your tips! Great Post :) Schau mal öfter vorbei! It was a very great and a useful post! this was a very helpful post! I need to do my own media kit soon! Really helpful post ! Thank you sweetie. Das ist ja mal ein interessanter Post, vielen Dank für die wertvollen Hinweise und Tipps! Wow I found it very useful, in fact I'm searching for collaborations, and this is perfect, a great schedule to fill in to present yourself and your blog without being out of topic! Such a wonderful guideline! This is so helpful! I just decided TODAY that I was going to make a media Kit-- I had no clue where to start/ what to include! Thank you for you help, I can't wait to get started on mine. this is really interesting and useful information to all of us bloggers that came by and read your fabolous blog! thanks! Very helpful post, I should create it for myself too!!! Thanks for sharing - these are great tips! Thanks for sharing!! Awesome post!! Now following via GFC! Hey, gefällt mir sehr eure Blog. Ich wohne auch bald wieder dort, stecke aber gerade mitten im Auslandssemster. Ich blogge erst wieder seit drei Monaten aber ich freue mich schon, wenn ich wieder zu Hause bin mehr am Blog zu basteln.